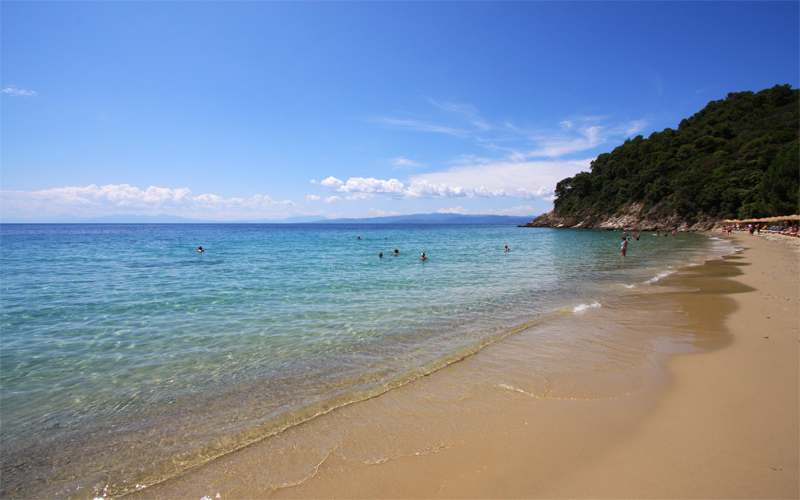 The relaxed island of Skiathos of the Sporades complex is the perfect summer destination for lazy days on the beach. Boasting some of the most breathtaking, magnificent golden beaches in the Aegean, it offers both organized and secluded coves. Most beaches are located close to our accommodation or the Town centre. Discover the best beaches in Skiathos, famed for their green landscape, calming atmosphere and crystalline emerald waters. 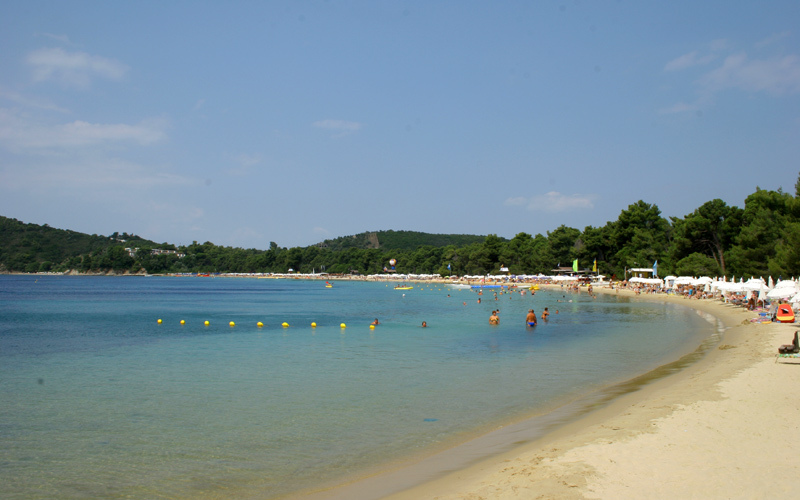 One of the best beaches in Skiathos for a relaxing day in the sun is the famous Koukounaries, the largest and most crowded of the island. Though the beach is well-organized with water sports, umbrellas, beach bars and taverns, it is an unspoiled destination and a protected environment, perfect for unwinding on the fine white sand. At the backdrop of this beautiful beach is a fragrant pine forest, in which there is a biotope with many protected plants and birds. Koukounaries can be reached by bus from SkiathosTown. 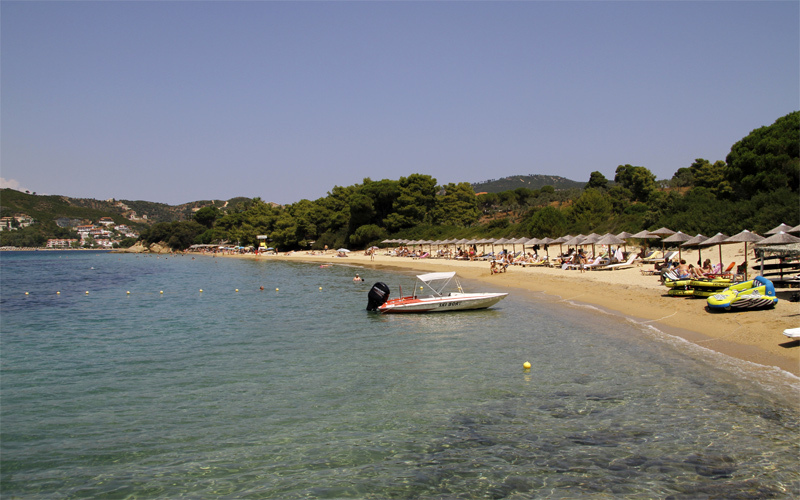 Just a short distance from the popular Koukounaries is the frequented beach of Banana, one of the best beaches in Skiathos. The sandy beach of Banana is organized with tourist amenities, water sports and a lot of cafes and taverns, making it a favourite meeting spot for young people. The beach is called Banana because of its shape and is surrounded by a thick pine forest, keeping the area cool and shady. 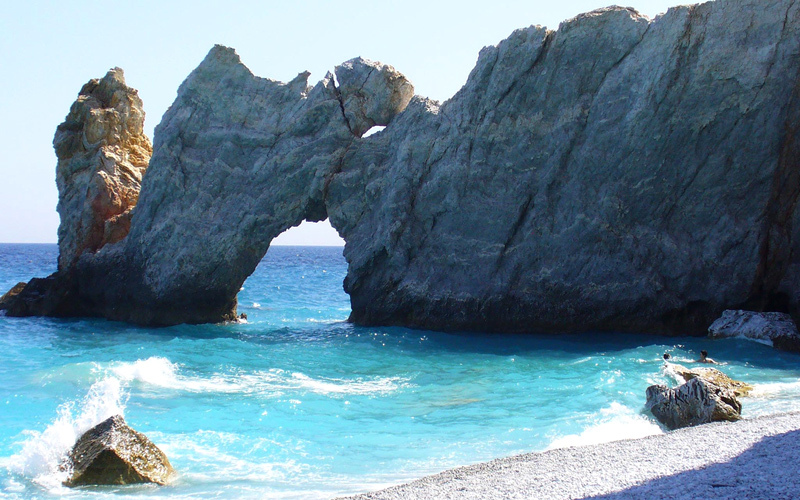 Lalaria is one of the most impressive and extraordinary isolated beaches in Skiathos. Its landscape is formed by a wonderful white shore with round soft pebbles, surrounded by white cliffs rising out of the sea, creating a natural passage through land and sea. It is a perfect place to relax and enjoy nature’s beauty or swim in the chill crystal blue waters. Lalaria beach is found on the north-eastern tip of the island, accessible only by tour boat from SkiathosTown. Vromolimnos is the next best thing after Koukounaries in terms of popularity. It is a wonderful long beach with calm blue waters, soft golden sand and lush greenery, with trees providing shade. This is an organized cove with many facilities, such as umbrellas, sun loungers, lively beach bars, taverns and water sports. There are also some quiet places with remarkable views, where you can just relax on the beach, away from the crowds and noise. Located on the south coast of Skiathos, close to Kolios resort, the beach is easily accessible by all means of transport from SkiathosTown. Situated at the south part of the island, just 7km from the main Town, Agia Paraskevi beach is rated among the best beaches in Skiathos, ideal for unwinding under the sun. This is a long shore with amazing golden sand and crystalline turquoise blue waters. Nearby, covered by verdant plane trees, there is a picturesque small church, dedicated to Agia Paraskevi, from which the beach took its name. Agia Paraskevi beach has an excellent tourist infrastructure and offers many accommodation options and taverns, but also fun water sports.